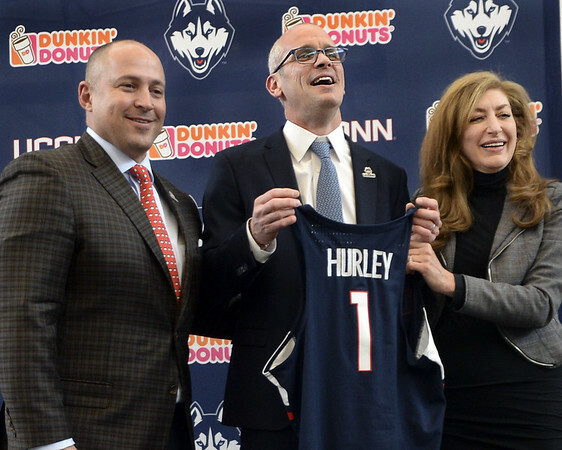 STORRS - Dan Hurley says he has landed at his dream coaching destination. David Benedict, UConn’s athletic director, said there was never a question of whether the school would have the resources to hire a top head coach. Hurley is the son of Hall of Fame New Jersey high school coach Bob Hurley Sr. and the brother of Arizona State coach Bob Hurley. “Coaches, families trust us with their kids because of the legacy my father has left as a Hall of Famer, but also as a community person who stands for the right things,” Hurley said. Posted in New Britain Herald, UConn on Friday, 23 March 2018 20:10. Updated: Friday, 23 March 2018 20:52.